She was the sister of a motorway incident victim. Lawyer Iryna Nozdrovska was found dead outside Kyiv on 1 January. She had dealth with the case of her sister Svitlana Sapatinska who was hit dead by a drunk driver two years ago. "Ira's body was found in a river near her village of Demydiv by a local resident. Ira has been identified. 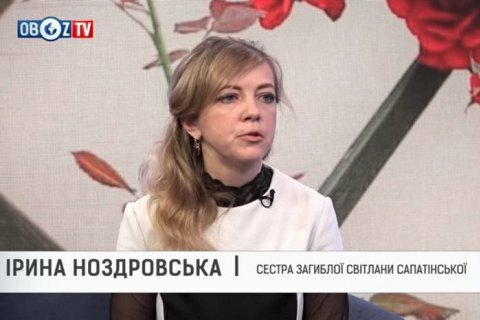 We had hoped until the last moment that she was still alive," journalist Volodymyr Tymofiychuk, who is close to the family, told Fakty. The head of the Interior Ministry's trade union, Illya Kiva, confirmed this to news-based 112 Ukrayina TV. Svitala Sapatinska was hit dead by a car on 30 September 2015. The driver was Dmytro Rossoshanskyy. According to Nozdrovska, at the moment of the incident, he was under the influence of drugs. His uncle was the chairman of the Vyshhorod district court, which helped the driver to avoid the punishment. It was not until May 2017 that Nozdrovska made sure that Rossoshanskyy gets punished. He was sent to prison for seven year. The court established that the driver saw the pedestrian but did not attempt to slow down to avoid the collision. Instead of calling an ambulance, he called his father for advice. Rossoshanskyy challenged the verdict, referring to violations allegedly committed by the court of the first instance. On 27 December, the case was sent for repeat consideration by a court of the first instance. The defendant was placed in custody for 60 days. A day after the court hearing, Iryna Nozdrovska went missing.